Alice Tarre y was one of almost 130 who died in the Rothsay Castle shipwreck to the west of the Great Orme. On 18 August 1831 the paddle steamer left Liverpool with passengers bound for Beaumaris. The vessel was decrepit, underpowered and worn out. Setting out at about midday it met a strong wind and a flood tide. The alarmed passengers asked one of their number, William Tarrey, agent to Lord Derby, to beg the captain to divert the ship to sheltered waters. Mr Tarrey was accompanied by Alice, his 35-year-old wife, and their five children. He found the captain drunk and his request was refused. Progress was slow. By 10pm they had only just passed the Great Orme. The ship began to take in water, which stopped the engine. Eventually it hit the notorious Dutchman’s Bank, a sandbank between Llanfairfechan and Puffin Island. The passengers were ordered to man the pumps, which proved to be useless. The vessel broke up. There were only 23 survivors. 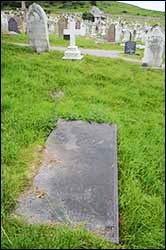 Alice was buried here, and her two-year-old son John at the parish church in Glan Conwy. As a result of the wreck, a lifeboat station and a lighthouse were established at Trwyn Du, near Puffin Island.